Name pronunciation varies by region. Many people in western states, including Kansas and parts of Colorado, pronounce it /ɑːrˈkænzəs/ ar-KAN-zəs, People in Oklahoma, Arkansas, parts of Colorado, and the majority of the remaining United States typically pronounce it /ˈɑːrkənsɔː/ AR-kən-saw, which is how the Arkansas state is always pronounced according to a state law passed in 1881. The path of the Arkansas River has changed over time. Sediments from the river found in a palaeochannel next to Nolan, a site in the Tensas Basin, show that part of the river's meander belt flowed through up to 5200 BP. Whilst it was previously thought that this relict channel was active at the same time as another relict of Mississippi River's meander belt, it has been shown that this channel of the Arkansas was inactive approximately 400 years before the Mississippi channel was active. The Arkansas has three distinct sections in its long path through central North America. 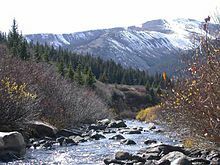 At its headwaters beginning near Leadville, Colorado, the Arkansas runs as a steep fast-flowing mountain river through the Rockies in its narrow valley, dropping 4,600 feet (1.4 km) in 120 miles (193 km). This section supports extensive whitewater rafting, including The Numbers (near Granite, Colorado), Brown's Canyon, and the Royal Gorge. At Cañon City, Colorado, the Arkansas River valley widens and flattens markedly. Just west of Pueblo, Colorado, the river enters the Great Plains. Through the rest of Colorado, Kansas, and much of Oklahoma, it is a typical Great Plains riverway, with wide, shallow banks subject to seasonal flooding and periods of dwindling flow. Tributaries include the Cimarron River and the Salt Fork Arkansas River. In eastern Oklahoma the river begins to widen further into a more contained consistent channel. To maintain more reliable flow rates, a series of large reservoir lakes have been built on the Arkansas and its intersecting tributaries including the Canadian, Verdigris, Neosho (Grand), Illinois, and Poteau rivers. These locks and dams allow the river to be navigable by barges and large river craft downriver of Muskogee, Oklahoma, where the McClellan-Kerr Arkansas River Navigation System joins in with the Verdigris River. Water flow in the Arkansas River (as measured in central Kansas) has dropped from approximately 248 cubic feet per second (7 m³/s) average from 1944-1963 to 53 cubic feet per second (1.5 m³/s) average from 1984–2003, largely because of the pumping of groundwater for irrigation in eastern Colorado and western Kansas. 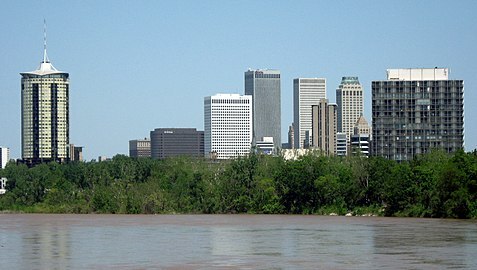 Important cities along the Arkansas River include Pueblo, Colorado; Garden City, Kansas; Dodge City, Kansas; Wichita, Kansas; Tulsa, Oklahoma; Fort Smith, Arkansas; and Little Rock, Arkansas. The I-40 bridge disaster of May 2002 took place on I-40's crossing of Kerr Reservoir on the Arkansas River near Webbers Falls, Oklahoma. 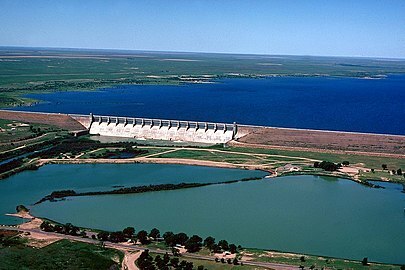 Since 1902, Kansas has claimed Colorado takes too much of the river's water, resulting in a number of lawsuits before the U.S. Supreme Court that continue to this day, generally under the name of Kansas v. Colorado. The problems over the possession and use of Arkansas River water by Colorado and Kansas led to the creation of an interstate compact or agreement between the two states. While Congress approved the Arkansas River Compact in 1949, the compact did not stop further disputes by the two states over water rights to the river. The Kansas-Oklahoma Arkansas River Basin Compact was created in 1965 to promote mutual consideration and equity over water use in the basin shared by those states. It led to the Kansas-Oklahoma Arkansas River Commission, which was charged with administering the compact and reducing pollution. The compact was approved and implemented by both states in 1970, and has been in force since then. The McClellan–Kerr Arkansas River Navigation System begins at the Tulsa Port of Catoosa on the Verdigris River, enters the Arkansas River near Muskogee, and runs via an extensive lock and dam system to the Mississippi River. Through Oklahoma and Arkansas, dams which artificially deepen and widen the river to sustain commercial barge traffic and recreational use give the river the appearance of a series of reservoirs. The McClellan–Kerr Arkansas River Navigation System diverts from the Arkansas River 2.5 mi (4.0 km) upstream of the Wilbur D. Mills Dam to avoid the long winding route which the lower Arkansas River follows. This circuitous portion of the Arkansas River between the Wilbur D. Mills Dam and the Mississippi River was historically bypassed by river vessels; early steamboats instead following a network of rivers—known as the Arkansas Post Canal—which flowed north of the lower Arkansas River and followed a shorter and more direct route to the Mississippi River. When the McClellan–Kerr Arkansas River Navigation System was constructed between 1963 and 1970, the Arkansas Post Canal was significantly improved, while the lower Arkansas River continued to be bypassed by commercial vessels. Many nations of Native Americans lived near, or along, the 1,450-mile (2,334-km) stretch of the Arkansas River for thousands of years. The first Europeans to see the river were members of the Spanish Coronado expedition on June 29, 1541. Also in the 1540s, Hernando de Soto discovered the junction of the Arkansas with the Mississippi. The Spanish originally called the river Napeste. "The name "Arkansas" was first applied by Father Jacques Marquette, who called the river Akansa in his journal of 1673. The Joliet-Marquette expedition travelled the Mississippi River from Prairie du Chien, Wisconsin towards the Gulf of Mexico, but turned back at the mouth of the Arkansas River. By that time, they had encountered Native Americans carrying European trinkets, and feared confrontation with Spanish conquistadors. French traders and trappers who had opened up trade with Indian tribes in Canada and the areas around the Great Lakes began exploring the Mississippi and some of its northern tributaries. They soon learned that the birch-bark canoes, which had served them so well on the northern waterways, were too light for use on the southern rivers, such as the Arkansas. They turned to making and using dugout canoes, which they called pirogues, made by hollowing out the trunks of cottonwood trees. [b] Cottonwoods are plentiful along the streams of the southwest and grow to large sizes. The wood is soft and easily worked with the crude tools carried by both the French and Indians. The pirogues were sturdier and could be more for navigating the sandbars and snags of the Southern waterways. In 1819, the Adams–Onís Treaty set the Arkansas as part of the frontier between the United States and Spanish Mexico. This continued until the United States annexed Texas after the Mexican–American War, in 1846. The treaty was made shortly after "Old Settler" Cherokees moved to near what became known as Webbers Falls on the Arkansas River. That area, then part of Arkansas Territory would become Indian Territory and later Oklahoma, was traditional territory of the Osage, leading to conflict and a treaty in 1828 but still unresolved by the time thousands of additional Cherokee refugees moved to the area during the Trail of Tears. By the time Fort Smith was established in 1817, larger capacity watercraft became available to transport goods up and down the Arkansas. These included flatboats (bateaus) and keelboats. Along with the pirogues, they transported piles of deer, bear, otter, beaver and buffalo skins up and down the river. Agricultural products such as corn, rice, dried peaches, beans, peanuts, snake root, sarsaparilla, ginseng had grown in economic importance. Later, the Santa Fe Trail followed the Arkansas through much of Kansas, picking it up near Great Bend and continuing through to La Junta, Colorado, unless users elected to take the challenging Cimarron Cutoff in Cimarron, Kansas. During the American Civil War, each side tried to prevent the other from using the Arkansas and its tributaries as a route for moving reinforcements. Initially, the Union Army abandoned its forts in the Indian Territory, including Fort Gibson and Fort Smith, in order to maximize its strength for campaigns elsewhere, while the Confederate Army sent troops from Texas to support its Native American allies. Union Troops returned later in the war, after defeating the Confederates at the Battle of Pea Ridge and the Battle of Fort Smith, and began recovering the position it had previously abandoned, most notably Fort Gibson, reopening the Arkansas River as a supply route. In September 1864, a body of Confederate irregulars led by General Stand Watie successfully ambushed a Union supply ship bound for Fort Gibson. The vessel was destroyed, and a part of its cargo was looted by the Confederates. In the 1880s, Charles "Buffalo" Jones, one of the cofounders of Garden City, Kansas, organized four irrigation companies to take water one hundred miles from the Arkansas River to cultivate 75,000 acres (300 km2) of land. By 1890, water from the Arkansas was being used to irrigate more than 20,000 acres (8,100 ha) of farmland in Kansas. 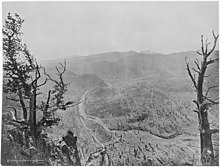 By 1910, irrigation projects in Colorado had caused the river to stop flowing in July and August. Flooding in 1927 severely damaged or destroyed nearly every levee downstream of Fort Smith, and led to the development of the Arkansas River Flood Control Association. It also led to the Federal Government assigning responsibility of flood control and navigation on the Arkansas to the U.S. Army Corps of Engineers (USACOE). The headwaters of the Arkansas River in central Colorado have been known for exceptional trout fishing, particularly fly fishing, since the 19th century, when greenback cutthroat trout dominated the river. Today, brown trout dominate the river, which also contains rainbow trout. Trout Unlimited considers the Arkansas one of the top 100 trout streams in America, a reputation the river has had since the 1950s. From Leadville to Pueblo, the Arkansas River is serviced by numerous fly shops and guides operating in Buena Vista, Salida, Cañon City and Pueblo. The Colorado Division of Wildlife provides regular online fishing reports for the river. A fish kill occurred on December 29, 2010, in which an estimated 100,000 freshwater drum lined the Arkansas River bank. An investigation, conducted by the Arkansas Game and Fish Commission, found the dead fish "... cover 17 miles of river from the Ozark Lock and Dam downstream to River Mile 240, directly south of Hartman, Arkansas." Tests later indicated the likely cause of the kill was gas bubble trauma caused by opening the spillways on the Ozark Dam. ^ A team led by Dr. George H. Odell, an anthropology professor from the University of Tulsa, uncovered artifacts that showed the natives were members of the Wichita people, and that the European artifacts also found there were of the same time period. Dr. Odell concluded this was most likely place that la Harpe met the natives he described. ^ Pirogues are still used in the swamps and marshes of South Louisiana by descendants of the "Cajuns," who were exiled from Canada by the British. ^ Fort Gibson had been built in 1824 on the bank of the Verdigris River in what had been called the "Three Forks" area of Indian Territory. ^ a b c "Arkansas River". Geographic Names Information System. United States Geological Survey. 1980-04-30. Retrieved 2010-09-20. ^ The mouth has changed since plotting by USGS. ^ The mouth has changed since plotting by USGS to Mississippi River Mile 580 from Mile 582 in the 1980 survey. ^ "McClellan-Kerr Arkansas River Navigation System (MKARNS)". History & Culture. The Encyclopedia of Arkansas. Retrieved 2010-09-20. ^ a b "USGS Gage #07263500 Arkansas River at Little Rock, AR". National Water Information System. U.S. Geological Survey. 1927–1970. Retrieved 2018-10-19. ^ J.C. Kammerer (May 1990). "Largest Rivers in the United States". United States Geological Survey. Archived from the original on 21 March 2007. Retrieved 2007-04-05. ^ "Chaffee County Colorado Gold Production". Westernmininghistory.com. 2007-02-13. Retrieved 2012-11-15. ^ Stewart, George R. (1967). Names on the Land. Houghton Mifflin Company. pp. 335–340. ^ Kellogg, Karl S.; et al. (2017). Geologic Map of the Upper Arkansas River Valley Region, North-Central Colorado. Reston, VA: U.S. Geological Survey. Retrieved 31 January 2018. ^ "Arkansas - Verdigris River Navigation" (PDF). American Canal Society. Retrieved April 30, 2017. ^ a b Odell, George H. "Lasley Vore Site." Encyclopedia of Oklahoma History and Culture. Accessed January 26, 2017. ^ a b c d e Wright, Muriel H. "Early Navigation and Commerce along the Arkansas and Red Rivers in Oklahoma." Chronicles of Oklahoma. Volume 8, Number 1, March, 1930. p. 65. Accessed September 29, 2017. ^ "Treaty with the Western Cherokee, 1828". Oklahoma State University Library. Retrieved 2017-03-28. ^ "A New Treaty" (PDF). Cherokee Phoenix. University of North Dakota. 1 (20). 1828-07-09. Retrieved 2017-03-28. ^ U.S. Army Corps of Engineers, Little Rock District/ Mission/Navigation. Accessed June 2, 2017. ^ a b "History of the Arkansas River (1540 to 2000)". South Central Service Cooperative. 2017. Accessed June 4, 2017. ^ Harris, William C. (September 1892). "The Trouts of Colorado and Utah". The American Angler. XXI (12): 515–528. ^ Ross, John (2005). Trout Unlimited's Guide to America's 100 Best Trout Streams. Guilford, CT: Lyons Press. pp. 241–243. ISBN 1-59228-585-6. ^ Campbell, Duncan (1960). 88 Top Trout Streams of the West. Newport Beach, CA: Western Outdoors. pp. 64–65. ^ Bartholomew, Marty (1998). Fly Fisher's Guide to Colorado. Belgrade, MT: Wilderness Adventures Press. pp. 38–49. ISBN 978-1-885106-56-8. ^ "Experts Close In On What Killed Fish - NW Arkansas News Story - KHBS NW Arkansas". KHBS. January 3, 2011. Archived from the original on 11 January 2011. Retrieved 4 January 2011. ^ a b "Arkansas River Fish Kill Investigation Continues". Arkansas Game and Fish Commission. 3 January 2011. Archived from the original on 8 August 2016. Retrieved 14 May 2017. ^ "Gas Bubble Trauma likely cause of fish kills". Arkansas Game and Fish Commission. Archived from the original on 8 August 2016. Retrieved 14 May 2017. 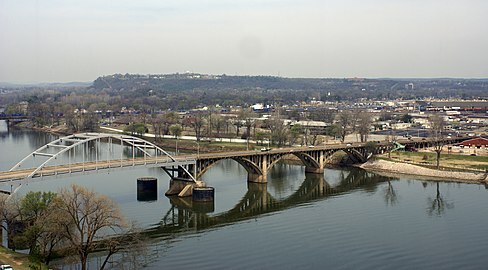 Wikimedia Commons has media related to Arkansas River. Wikisource has the text of the 1921 Collier's Encyclopedia article Arkansas River. "Arkansas, a river of the United States of America" . Encyclopædia Britannica (11th ed.). 1911. "Arkansas River" . New International Encyclopedia. 1905. "Arkansas" . Encyclopædia Britannica. 2 (9th ed.). 1878. Arkansas River is discussed at the end of this article. "Arkansas, a S. W. river of the United States" . The American Cyclopædia. 1879. This page was last edited on 15 April 2019, at 20:23 (UTC).